3. Japan Institute for Food Education and Health, Heian Jogakuin (St. Agnes') University, Kyoto, 602-8013, Japan. Background: Hypotonic shock induces cytocidal effects through cell rupture, and cancer therapy based on this mechanism has been clinically administered to hepatocellular carcinoma patients. We herein investigated the effectiveness of hypotonic shock combined with the inhibition of regulatory volume decrease as cancer therapy for hepatocellular carcinoma. Methods: Morphological changes in human hepatocellular carcinoma cell lines were observed under a differential interference contrast microscope connected to a high-speed digital video camera. Cell volume changes under hypotonic shock with or without chloride, potassium, or water channel blockers were observed using a high-resolution flow cytometer. In order to investigate cytocidal effects, the number of surviving cells was compared after exposure to hypotonic solution with and without each channel blocker (re-incubation experiment). Results: Video recordings showed that cells exposed to distilled water rapidly swelled and then ruptured. Cell volume measurements revealed regulatory volume decrease under mild hypotonic shock, whereas severe hypotonic shock increased the number of broken fragments as a result of cell rupture. Moreover, regulatory volume decrease was inhibited in cells treated with each channel blocker. 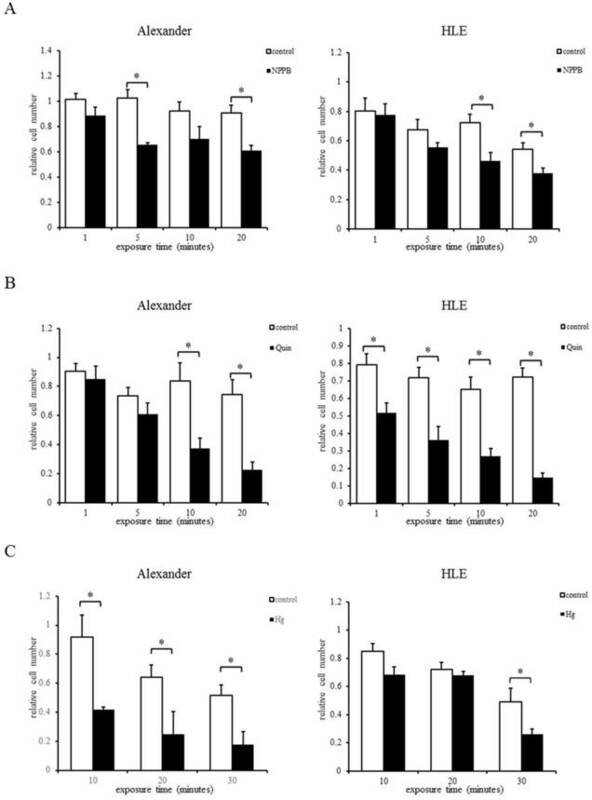 Re-incubation experiments showed the cytocidal effects of hypotonic shock in cells exposed to hypotonic solution, and additional treatments with each channel blocker enhanced these effects. Conclusion: The inhibition of regulatory volume decrease with chloride, potassium, or water channel blockers may enhance the cytocidal effects of hypotonic shock in hepatocellular carcinoma. Hypotonic shock combined with the inhibition of regulatory volume decrease was a more effective therapy than hypotonic shock alone. Keywords: Hepatocellular carcinoma, Regulatory volume decrease, hypotonic shock, potassium ion transport, chloride ion transport. Hepatocellular carcinoma (HCC) is a very common malignancy, and its estimated age-standardized mortality is the third highest worldwide . Although recent advances in treatments directed at HCC patients have improved prognoses [2-3], those of HCC patients with spontaneous rupture have remained poor [4-5]. Previous studies identified HCC rupture as an independent risk factor for peritoneal metastasis in HCC patients [6-8], therefore, an effective therapy that prevents the development of peritoneal metastasis needs to be established. Hypotonic shock is considered to induce cytocidal effects through cell rupture, and cancer therapy based on this mechanism is clinically administered to HCC patients, e.g. intraoperative peritoneal lavage with distilled water. This lavage procedure has been performed on digestive cancer patients, and has cytocidal effects on exfoliated viable cancer cells, thereby preventing peritoneal recurrence. We previously demonstrated the cytocidal effects of this therapy on esophageal, gastric, pancreatic and colorectal cancers in vitro and in vivo [9-14]. The efficacy of this therapy for HCC was reported previously, and has been employed during surgery [15-16]. However, we also showed that the osmolality of peritoneal lavage fluid collected from patients undergoing peritoneal lavage with distilled water increased to mild hypotonicity due to the contamination of disrupted cells . Cancer cells often avoid rupture under mild hypotonicity through regulatory volume decrease (RVD), which is homeostatic volume regulation by water transport via the activation of chloride and potassium conductance, and the cytocidal effects of peritoneal lavage with distilled water may decline as a result of osmotic increases. Therefore, we considered it necessary to simultaneously regulate RVD in cancer cells in order to improve the efficacy of intraoperative peritoneal lavage with distilled water. In the present study, we analyzed changes in cellular morphology and volume after hypotonic shock, and investigated the osmolality and incubation time needed to kill HCC cells using several unique methods, such as a differential interference contrast (DIC) microscope connected to a high-speed digital video camera, a high-resolution flow cytometer, and re-incubation experiments. We demonstrated that the cytocidal effects of hypotonic shock were enhanced in HCC cells under the inhibition of RVD by the chloride channel blocker, 5-nitro-2-(3-phenylpropylamino)-benzoic acid (NPPB), potassium channel blocker, quinine hydrochloride (Quin), and water channel blocker, mercury chloride II (Hg). These results suggest that hypotonic shock combined with the inhibition of RVD is a more effective therapy than hypotonic shock alone. The human HCC cell lines, HLE and Alexander, were obtained from the Japanese Collection of Research Bioresources Cell Bank. These cells, which had undergone less than thirty passages, were used in all analyses. They were grown in plastic culture flasks (Corning Incorporated, NY, USA); HLE cells were maintained in DMEM medium (Nacalai Tesque, Kyoto, Japan) and Alexander cells were maintained in RPMI-1640 medium (Nacalai Tesque, Kyoto, Japan). Each medium was supplemented with 10% fetal bovine serum (FBS), 100 U/ml of penicillin, and 100 μg/ml of streptomycin. Flasks were kept in a humidified incubator at 37ºC under 5.0% CO2 in air. NPPB was purchased from BIOMOL International, L.P. (Plymouth Meeting, PA, USA). Quin and Hg were purchased from Nacalai Tesque. The 140 mM NaCl isotonic solution contained 140 mM NaCl, 5.0 mM KCl, 1.0 mM CaCl2, 1.0 mM MgCl2, 5.0 mM glucose, and 10 mM HEPES. The pH of each solution was adjusted to 7.4 with NaOH. In order to analyze changes in the volumes of cells subjected to hypotonic shock at various osmolarities, graded hypotonic NaCl solution was produced by diluting the stock NaCl solution with distilled water, for example, 1/4 NaCl solution indicated NaCl solution diluted 4-fold with distilled water. HCC cells were washed with PBS and then detached from the flask using trypsin-EDTA. These cells were subsequently transferred to a centrifuge tube and centrifuged at 800 rpm for 5 min. The supernatant was then discarded, isotonic NaCl solution was added to the pelleted cells, and the suspended cells were mounted on a coverslip that had been pre-coated with neutralized Cell-Tak (Becton-Dickinson Labware, Bedford, MA, USA) in order to retain them firmly. The coverslip was then placed in a perfusion chamber that had been mounted on the stage of a DIC microscope (ECLIPSE Ti, Nikon, Japan) connected to a video-enhanced contrast (VEC) system (ARGUS-20, Hamamatsu Photonics, Hamamatsu, Japan), and images were continuously recorded by a video recorder, according to a previously described procedure [9-12]. Experiments were carried out at room temperature (20-24ºC). The volume of the perfusion chamber was approximately 20 μl, and the rate of perfusion was 200 μl/min. The isotonic NaCl solution was initially perfused through the chamber, then replaced with distilled water, and morphological changes in HCC cells were observed. The method of individual cell volume measurements has been described previously [17-19]. During experiments, a movie of morphological changes was recorded using a DIC microscope connected to a high-speed digital video camera. The area of single HCC cells was measured from the recording every 30 seconds from the start of the experiments to 10 minutes later using DIPP-Motion, which is 2D motion capture software. The area of HCC cells before the start of the experiment was used as the control value (A0). The relative volume of a HCC cell was expressed as V/V0 [= (A/A0)1.5], where V is the volume, A is the area, and subscript 0 indicates the control value. The values of V/V0 from four experiments were expressed as the mean ± SEM. Cell volume measurements were performed using a high resolution flow cytometer, the Cell Lab Quanta (Beckman Coulter, Fullerton, CA, USA), according to a previously described procedure [9-12]. This flow cytometer was designed to measure the electronic volume (EV) of a cell, and the EV data of more than 10,000 cells were collected and analyzed using Quanta control software. HCC cells grown in culture flasks were detached using trypsin-EDTA and centrifuged. A total of 1.0×106 pelleted cells were then suspended in 1 ml of distilled water or hypotonic NaCl solution of various osmolarities to induce hypotonic shock. The suspended solution was subsequently displaced into a Vi-CELLTM Sample Cup (Beckman Coulter), and cell volume was measured 1, 5, 10, and 20 min after the exposure to each solution. The cell suspension in the isotonic NaCl solution was used as a control sample without hypotonic shock (0 min). In the chloride channel regulation experiments, cells were pre-incubated with culture medium containing 200 μM NPPB at 37ºC for 30 min under 5.0% CO2 in air. In the potassium channel regulation experiments, cells were suspended in NaCl solution containing 1 mM Quin at room temperature for 15 min before hypotonic shock. A previous study reported that Hg inhibited RVD without a pre-treatment ; therefore, a pre-treatment was not performed to avoid cell toxicity by Hg in the water channel regulation experiments. In all regulation experiments, hypotonic solution containing each blocker: 200 μM NPPB, 1 mM Quin, or 2.5 μM Hg, was used during hypotonic shock. HCC cells grown in culture flasks were detached using trypsin-EDTA and centrifuged. A total of 2.0×105 pelleted HLE cells or 4.0×105 pelleted Alexander cells were then suspended in distilled water and incubated for 1, 5, 10, or 20 min. Thereafter, the suspension was centrifuged, and the pelleted cells were re-suspended in culture medium and seeded on Costar 6-well plates (Corning Incorporated, NY, USA). At a set time of 48 h after plating, cells were detached from the plates in trypsin-EDTA solution, and a viable cell count was performed using Trypan blue and the Countess Automated Cell Counter (Invitrogen, Tokyo, Japan). The cell suspension in the isotonic NaCl solution was used as a control sample without hypotonic shock (0 min). A total of 2.0×105 HLE or Alexander cells were seeded on 6-well plates. Medium was removed 24 h after plating, and distilled water was then applied to adherent HCC cells, which were incubated for 1, 5, 10, or 20 min. After this treatment, distilled water was exchanged to medium containing FBS. At a set time of 48 h after the treatment, a viable cell count was performed using a similar method to the DW re-incubation experiment on suspended cells. In all channel regulation experiments, a similar pretreatment method to the measurement of cell volume changes was performed. The total cell number after re-incubation for 48 h after each treatment was counted by a similar method to that used in the DW re-incubation experiments. The relative cell number (total cell number/total cell number at 0 min) was assessed at the indicated time after exposure to the hypotonic solution containing a channel blocker: 200 μM NPPB, 1 mM Quin, or 1 μM Hg, or control hypotonic solution. In the chloride channel regulation experiments, 1/8 NaCl solution was used as the hypotonic solution for Alexander cells, while 1/6 NaCl solution was used for HLE cells. Hypotonic solution containing 0.2% DMSO was used as the control solution. In the potassium channel regulation experiments, 1/8 NaCl solution was used as the hypotonic solution for Alexander cells, while 1/4 NaCl solution was used for HLE cells. In the water channel regulation experiments, 1/4 NaCl solution was used as the hypotonic solution for Alexander cells, while 1/6 NaCl solution was used for HLE cells. Results were expressed as means ± SEM. Statistical analyses were carried out using the Student's t-test. Differences were considered significant when the p-value was <0.05. Statistical analyses were performed using JMP version 10. Morphological changes were observed in HCC cells after exposure to distilled water using a DIC microscope connected to a VEC system. HCC cells started to swell as soon as they were exposed to distilled water, and continued to swell until they ruptured. Alexander cells ruptured 567.2 ±64.4 sec (n=17, mean ± SEM) after being exposed to distilled water, while HLE cells ruptured after 449.5 ±53.3 sec (n=13, mean ± SEM) (Fig. 1A). Moreover, volume changes in four individual cells were measured for 10 minutes (Fig. 1B). The cell volume of Alexander cells increased 7-fold in 10 minutes, and one of the four cells ruptured 10 minutes after being exposed to distilled water. The volume of HLE cells increased 4-fold in 10 minutes, and two out of the four HLE cells ruptured 7 minutes and 8 minutes after being exposed to distilled water. The capacity of a cell to increase in volume was larger in Alexander cells than in HLE cells. 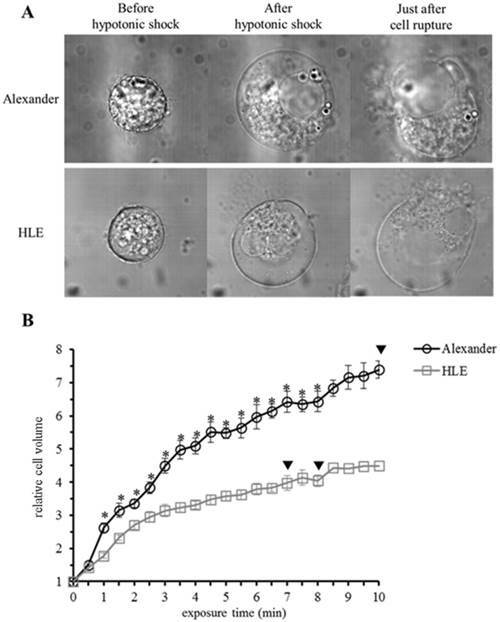 Moreover, the time required for cell rupture was longer in Alexander cells than in HLE cells. Morphological changes in individual HCC cells after hypotonic shock induced by distilled water. (A), Representative images of HLE and Alexander cells before and after hypotonic shock induced by distilled water. (B), Cell volume changes in individual HCC cells after hypotonic shock induced by distilled water. Cell volumes were measured every thirty seconds from the start of the exposure to distilled water to 10 minutes later. Results are presented as the mean ± SEM (n=4). The inverted triangle indicates that one out of four cells ruptured at this time point. *p<0.05, significant difference between each cell line at the same time point. In order to analyze serial cell volume changes in HCC cells after hypotonic shock at various osmolarities, we simultaneously assessed cell volumes and counts after hypotonic shock using Cell Lab Quanta. Figure 2 shows the results for Alexander (Fig. 2A) and HLE (Fig. 2B) cells before and after hypotonic shock at various osmolarities. During the exposure to mild hypotonic shock, cell volumes initially increased, which indicated cell swelling, and subsequently decreased gradually to the level of pre-hypotonic shock despite the continuous presence of extracellular hypotonic solution, which indicated RVD. During the exposure to severe hypotonic shock using distilled water or 1/16 NaCl solution, cell volumes also initially increased and then markedly decreased 5 or 20 min after being exposed. Cell volumes at these points were smaller than the initial cell volumes in all HCC cell lines. These results suggest that most cells had ruptured and broken into small fragments. 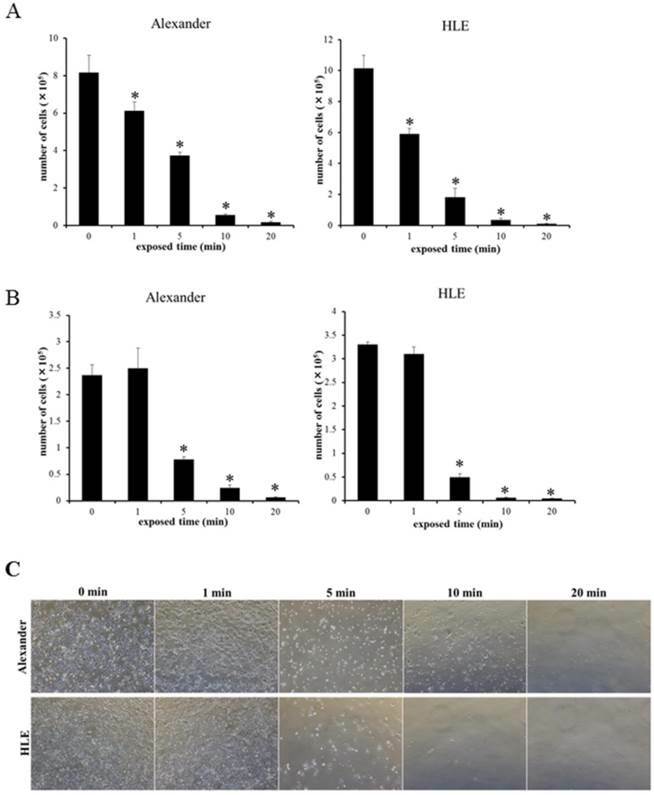 Moreover, a marked increase was observed in the number of broken fragments of HLE cells exposed to 1/8 NaCl solution, whereas only a slight increase was observed in those of Alexander cells, suggesting that Alexander cells were more resistant to hypotonic shock than HLE cells. Cell volume changes in HCC cell populations after hypotonic shock. The cell volumes and cell counts of Alexander (A) and HLE (B) cells were simultaneously assessed 1, 5, 10, and 20 min after hypotonic shock at various osmolarities using a high-resolution flow cytometer, the Cell Lab Quanta. Isotonic NaCl solution was diluted 2-, 4-, 8-, and 16-fold with distilled water. A cell suspension in isotonic NaCl solution was used as a control (0 min). 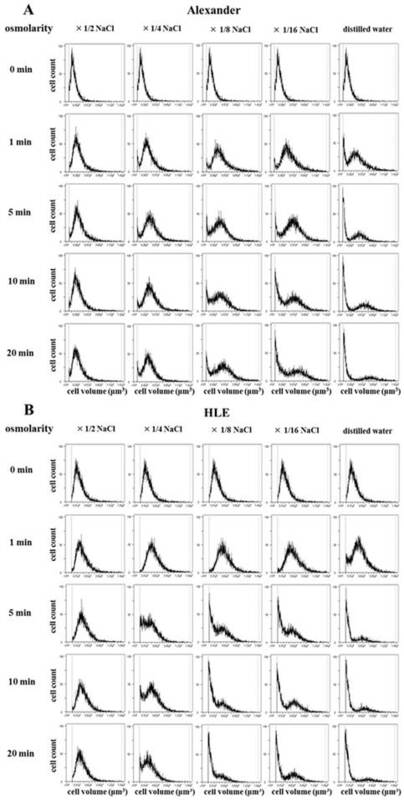 In order to confirm the cytocidal effects of hypotonic shock induced by distilled water on HCC cancer cells, suspended HCC cell lines were re-incubated following their exposure to distilled water, and the cultured cell number was counted 48 hours later. The decreases observed in the number of HCC cells were dependent on the exposure time to distilled water (Fig. 3A). Few cells in each HCC cell line survived 48 h after a 10-min exposure to distilled water. The number of surviving cells was larger in Alexander cells exposed to distilled water for 1 or 5 min than in HLE cells. This result suggests differences in resistance to the cytocidal effects of hypotonic shock between each cell line, similar to cell volume changes in cell populations after hypotonic shock. Furthermore, we investigated the cytocidal effects of distilled water on adherent HCC cells without the trypsin-EDTA treatment before hypotonic shock because this treatment may substantially change cell membrane structures and cell surface adhesion molecules, which may consequently result in artificially elevated sensitivity to hypotonic shock. The results obtained showed that the cytocidal effects of distilled water on adherent HCC cells were similar to those observed on suspended cells (Fig. 3B, 3C). Therefore, the extent of the cytocidal effects exerted by distilled water was similar in adherent and suspended HCC cells. 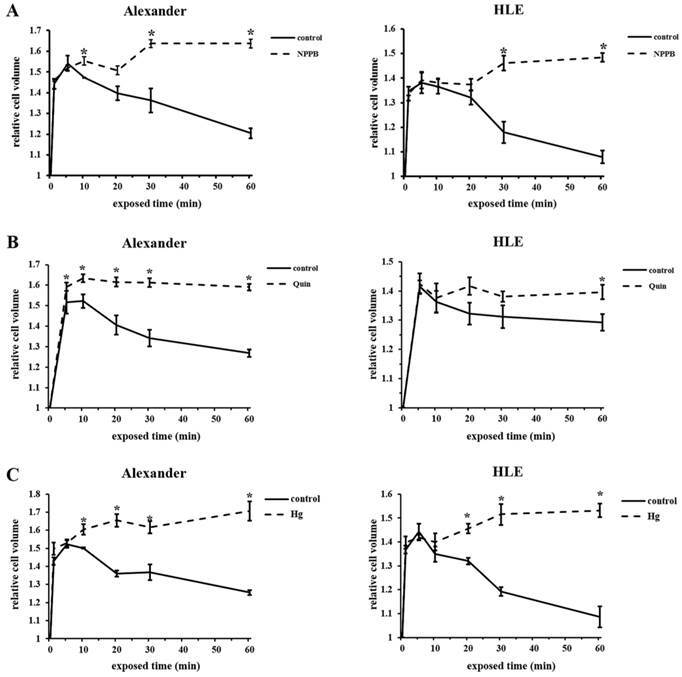 Re-incubation experiments on suspended HCC cells (A) and a cell viability assay on adherent HCC cells (B) after exposure to distilled water for 1, 5, 10, and 20 min. The number of cultured cells 48 h after exposure to distilled water was counted. Results are presented as the mean ± SEM (n=4). *p<0.05, significantly different from 0 min. (C), Representative images of cultured cells 48 h after adherent HCC cells were exposed to distilled water for the indicated time. We previously reported that the blockade of chloride ion transport inhibited RVD using NPPB in esophageal, gastric, pancreatic, and colorectal cancer cells [9-12]. Furthermore, RVD was shown to be inhibited by Quin or Hg through the blockade of potassium ion or water transport [20-23]. In order to investigate whether the regulation of ion and water transport affected cell volume changes in HCC cells after hypotonic shock, mean cell volumes were measured following exposure to the hypotonic NaCl solution with or without NPPB (DMSO was used as a control), Quin, or Hg using Cell Lab Quanta. Serial changes in the mean cell volume of HCC cells following their exposure to hypotonic solutions with or without each blocker are shown in Figure 5A-C. The cell volume of HCC cells treated with control hypotonic solution initially increased for 5 min, and subsequently decreased from 10 min after the start of this treatment, which indicated RVD. In contrast, the cell volume of HCC cells treated with hypotonic solution containing NPPB, Quin, or Hg increased for 5 min, but did not subsequently decrease 10 min after the start of this treatment. These results suggest that each channel blocker inhibited RVD in HCC cell lines. Effects of channel blockers on hypotonicity-induced cell volume changes in HCC cells. (A) Cell volume was measured at the indicated time after exposure to 1/2 NaCl solution containing 200 μM NPPB or 0.2% DMSO (control). The cell suspension in isotonic NaCl solution containing NPPB or DMSO was used as a sample without hypotonic shock (0 min). (B) Cell volume was measured after exposure to 1/2 NaCl solution with 1 mM quinine hydrochloride (Quin) and non-treated 1/2 NaCl solution (control). The cell suspension in isotonic NaCl solution with or without 1 mM Quin was used as a sample without hypotonic shock (0 min). (C) Cell volume was measured after exposure to 1/2 NaCl solution with 2.5 μM mercury chloride II (Hg) and non-treated 1/2 NaCl solution (control). The cell suspension in isotonic NaCl solution with or without 2.5 μM Hg was used as a sample without hypotonic shock (0 min). Results are presented as the mean ± SEM (n=3-5). *p<0.05, significant difference from the control at the same time point. In order to investigate whether the cytocidal effects of mild hypotonic shock on HCC cells were induced by the inhibition of RVD, HCC cells exposed to hypotonic solution containing NPPB, Quin, or Hg were re-incubated, and the number of these cultured cells was counted 48 hours after the treatment. Previous studies reported that NPPB, Quin, and Hg induced cytotoxicity and adverse events [24-26]. Therefore, we examined HCC cells treated with isotonic NaCl solution containing each blocker. No cellular toxicity or cytocidal effects were observed in HCC cells treated with isotonic solution containing each channel blocker (data are not shown). Figure 5A shows the relative number of surviving cells after their exposure to the hypotonic NaCl solution with DMSO (control) or NPPB. Enhanced cytocidal effects were observed in HCC cells exposed to hypotonic solution containing NPPB. In the potassium channel regulation experiments, cytocidal effects were enhanced more in HCC cells exposed to Quin than in those exposed to the control (Fig. 5B). In the water channel regulation experiments, enhanced cytocidal effects were observed on HCC cells exposed to Hg. Re-incubation of HCC cells after their exposure to hypotonic solution containing each channel blocker: NPPB (A), Quin (B), or Hg (C). The relative cell number (total cell number/total cell number at 0 min) was assessed at the indicated time after exposure to the hypotonic solution containing each channel blocker or control hypotonic solution (control). Results are presented as the mean ±SEM (n=4). *p<0.05, significant difference from the control at the same time point. HCC is one of the most common cancers worldwide, with 782,451 new cases being reported in 2012 and approximately 745,533 HCC patients dying each year . HCC is the second most common cause of death from cancer. In recent years, the pathogenic mechanism of HCC has been elucidated and various therapies have been developed for critical prevention and a complete cure. However, the prognosis of HCC patients has remained poor. The progression pattern of HCC cases is regarded as unique from other cancers, with distal, lymphatic, and peritoneal metastases being infrequently reported. In contrast, multiple primary cancers often synchronously or metachronously occur in the liver. However, a previous study showed that peritoneal metastasis often occurred in HCC cases with a previous history of tumor rupture [6-8, 27]. Exfoliated cancer cells have been suggested to spread in the abdominal cavity at the rupture of HCC tumors and implant onto the peritoneum, resulting in peritoneal metastasis . Therefore, the prevention of peritoneal metastasis in HCC patients with tumor rupture is needed. Peritoneal lavage with distilled water is regarded as an effective therapy for the prevention of peritoneal recurrence in spontaneously ruptured HCC. Previous studies reported that peritoneal lavage with distilled water significantly decreased tumor recurrence rates, and improved disease-free survival and overall survival in patients undergoing liver resection for spontaneously ruptured HCC [15,16]. However, we previously demonstrated that the osmolality of peritoneal lavage fluid collected from patients undergoing peritoneal lavage with distilled water was 54.7 mosmol/kg/H2O because of contamination by existing intraperitoneal secretions and the many cell types present in the peritoneal cavity , which may weaken the cytocidal effects induced by hypotonic shock. Under mild hypotonicity, human cells transiently swell and subsequently return to their original volume, thereby avoiding cell rupture. This phenomenon is generally called RVD, which is homeostatic cell volume regulation by water transport via the activation of potassium and chloride conductance. Hypotonic shock activates chloride and potassium channels (for example, VSOR and swelling-activated potassium channels) [29-31]. Therefore, the intracellular concentrations of potassium and chloride decrease, and intracellular water then moves to the extracellular side [29, 32, 33]. RVD may rescue exfoliated cells from rupture by peritoneal lavage with distilled water, leading to peritoneal recurrence. Therefore, we herein investigated whether the inhibition of RVD enhanced the cytocidal effects of mild hypotonic shock in HCC with the aim of establishing more effective peritoneal lavage to prevent peritoneal metastasis. We observed morphological changes in individual HCC cells exposed to distilled water using a DIC microscope connected to a VEC system. HCC cells rapidly swelled and ruptured almost 10 minutes after the start of hypotonic shock. The volumes of these cells increased from 4-fold to 7-fold within 10 minutes (Fig. 1). A previous study reported that biological membranes have the ability to expand elastically by 3% before rupturing ; however, the cell surface area, which was calculated using DIC images, increased 2.5- to 4-fold in the present study. This may have been because the in-folded plasma membrane expanded, and more membrane was added from internal stores by cell surface area regulation (SAR) [35-36]. Furthermore, differences were observed in the capacity of Alexander and HLE cells to increase in volume. Volume measurements of cell populations using a flow cytometer and DW-reincubation experiments revealed that Alexander cells were more resistant to hypotonic shock than HLE cells. This result suggests that the capacity of cells to increase their volume is related to resistance to cytocidal effects and rupture by hypotonic shock. We then observed cell volume changes in cancer cell populations exposed to hypotonic shock using a high resolution flow cytometer, the Cell Lab Quanta (Beckman Coulter, Fullerton, CA, USA). During exposure to severe hypotonic shock, increases in the number of small fragments were noted after cell swelling. These results suggest that most cells had ruptured and broken into fragments. RVD was observed during the exposure to mild hypotonic shock (Fig. 2). We previously demonstrated the inhibitory effects of RVD and enhanced cytocidal effects of hypotonic shock under the regulation of chloride ion movement with NPPB [9-12]. In the present study, potassium and water channel blockers were additionally employed in order to examine the importance of inhibiting RVD in peritoneal lavage with distilled water. A previous study reported that Quin and Hg inhibited RVD in other cell types [20-23], and we used these blockers as RVD inhibitors. We showed that RVD was clearly inhibited by these inhibitors, and the cytocidal effects of mild hypotonic shock in HCC cells treated with RVD inhibitors were enhanced in re-incubation experiments under channel regulation (Fig. 4, 5). Although the microenvironment of exfoliated cells is far more complex than laboratory settings, we considered the present results to show that exposure to hypotonic solution containing RVD inhibitors may be effective as a cancer treatment for HCC. However, NPPB, Quin, and Hg are toxic drugs that induce various organ disorders, and it is difficult to administer these drugs clinically [24-26]. Moreover, the safety of peritoneal lavage with distilled water has yet to be established; it has been suggested to induce water intoxication . We previously reported that severe hypotonic shock induced cell rupture in human lung fibroblast WI38 cells. Furthermore, cancer cells were found to be more sensitive to hypotonic shock than fibroblast cells . We also showed that all mice that underwent peritoneal lavage with distilled water survived, suggesting that distilled water did not cause fatal damage in vivo . Therefore, peritoneal lavage with distilled water containing RVD inhibitors may be an effective therapy for preventing peritoneal metastasis in HCC patients with tumor rupture if safe RVD inhibitors are used. In conclusion, we herein demonstrated the cytocidal effects of hypotonic shock induced by distilled water in HCC cells under the regulation of RVD with chloride, potassium, and water channel blockers. Hypotonic shock combined with the inhibition of RVD was a more effective therapy than hypotonic shock alone. This work was supported by a Grant-in-Aid for Scientific Research (C) (26461988) from the Japan Society for the Promotion of Science. Corresponding author: Dr. Atsushi Shiozaki, Assistant Professor, Division of Digestive Surgery, Department of Surgery, Kyoto Prefectural University of Medicine, 465 Kajii-cho, Kamigyo-ku, Kyoto 602-8566, Japan. Tel. : +81 752515527, Fax: +81 752515522, e-mail: shiozakikpu-m.ac.jp.